Through the years, Barbara has developed many unique styles. 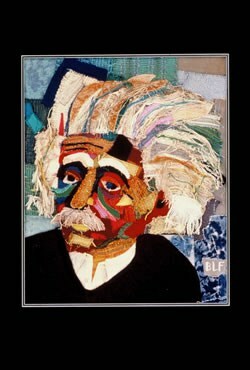 The work “Albert Einstein” is part of her de-construction style where many of the fabrics are partially taken apart. Ultrasuede and upholstery fabrics were used. They were further embellished with machine embroidery. Dry-mounted prints size 16 x 20 inches are available at $45.00 each. This does not include shipping. Blank Cards with this image are for sale at ten for $15.00.